New Delhi, 5th January: The much awaited fourth season of Pro Wrestling League #PWL4, the biggest Olympic wrestling league in the country is scheduled to start from 14th January and will go on till 31st January. In its fourth season, the Pro Wrestling league is becoming bigger and better as during the players draft, the top Indian wrestlers were picked up by the franchisee teams- Bajrang Punia was picked up by NCR Punjab Royals for 30 lacs; Vinesh Phogat was chosen by Mumbai Maharathi for 25 lacs and Sakshi Malik by Delhi Sultans for 20 lacs respectively. The league offers a price purse of Rs 1.9 crores for the winning team and Rs 1.1 crore for the runners-up team. There are totally six competing teams – Delhi Sultans, UP Dangal, Haryana Hammers, MP Yodha, Mumbai Maharathi and the NCR Punjab Royals. 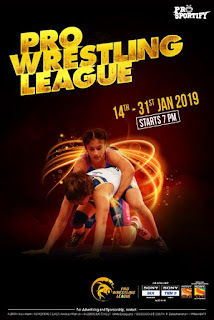 The promotional campaign of the Pro Wrestling League - season four was launched across all offline and online mediums including TV, Print, Radio, Outdoor and Digital media. The TVC campaign features top Indian champion wrestlers including –Bajrang Punia, Sumit Malik, Pooja Dhanda, Sakshi Malik and Vinesh Phogat. The league will be telecasts live and exclusive on SONY SIX (English) +HD, SONY-TEN 3 (Hindi) +HD, SONY WAH and for sports lovers on the move, the league is also being streamed LIVE on SONY LIV App.